4.4 cu. ft. Mini Refrigerator in Black - ENERGY STAR® Whether you want extra refrigerator space at home or you're university bound, this Magic Chef mini fridge has the storage options you're looking for and then some. A can rack conveniently keeps pop organized and within reach while additional door shelves provide space for other frequently used items. Plus, as an energy efficient appliance, you'll not only save money when you use the refrigerator, but you'll reduce your global footprint too. How cool is that? 4.4 cu. 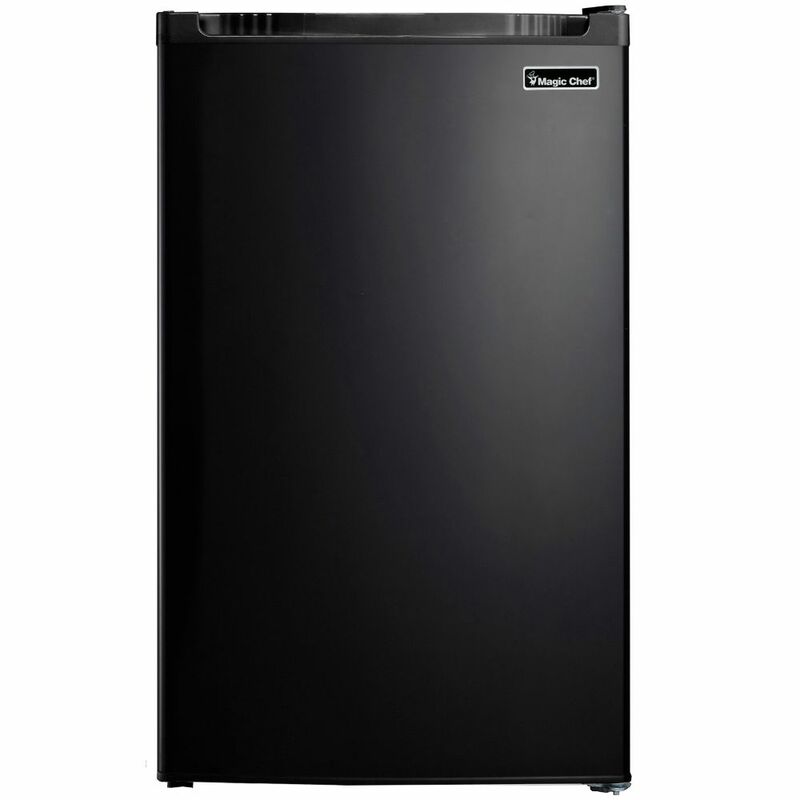 ft. Mini Refrigerator in Black - ENERGY STAR® is rated 3.7 out of 5 by 3. Rated 1 out of 5 by David from Did not last I purchased this fridge about a year and a half ago and the compressor recently quit. The full warranty is for only one year. While there is a five year warranty on the compressor I was told by the service technician that the cost of labour to make the repairs would be more than buying a new fridge. Rated 5 out of 5 by Kimberly from Perfect for a guest fridge We have always planned to put a "coffee bar" in the guest room but haven't gotten around to it. We had a load of company coming and figured we should at least make some efforts so I started with the fridge. The only issue I have is that it can't be built in or recessed. I am not sure if this is clearly stated in the ad and have not had time to look. I found it in the manual after it was all setup and ready to go so decided to just keep it and get a new, built in bar fridge when we do the actual reno. This one is quiet and could be used in a number of other places in the house or barn. Rated 5 out of 5 by JBK44 from Perfect! This small fridge is perfect! Great addition to a larger one or for a single person. I placed that small 'guy' in my dining area with black & red microwave on top and this set looks great! Beautiful finish inside and outside and arrangement of shelves inside is great as well.I will recommend this item to anyone looking for a small fridge. Can this fridge be built in or recessed? Yes but please leave 3-5 inches around the unit so the air will circulate. Without proper ventilation the compressor can freeze up. Most of the 'built in' units you will find have front ventilation. Is the door reversible? I need the door to open the other way. Purchased this model today. Yes, the door is reversible. Glass shelves are removable/adjustable. The unit is also very quiet.